Sunnyvale, CA — September 1, 1981 — File management on a personal computer — record filing, searching, sorting, printing reports and mailing labels — is fast and simple with the new VisiFile™ program from Personal Software Inc.
VisiFile greatly increases the usefulness of a personal computer for keeping business records. The program's flexibility allows many different applications — inventory, client lists and records, sales information, medical records and other word or numerical data — to be stored, sorted and printed in a variety of formats. "The ‘human interface’ of the program makes it extremely easy to use," said Ed Esber, director of merchandising. "Even people who are unfamiliar with computers will be able to master the program and begin to use it right away. Instructions are simple and direct and are selected from an easy-to-understand ‘menu’ system." The VisiFile FlexFormat™ feature makes it easy to change, rearrange and add unforeseen information to records, or combine business records into new files. This means that record keeping can adapt quickly as business information needs change. For example, the change from a five-digit to nine-digit zip code could be handled without rekeying all the data. Users may also creata a "partial file definition" for extremely fast data entry of specific portions of records. The ability of VisiFile to communicate with other Personal Software products (such as the VisiCalc®, VisiPlot™ and VisiTrend™/VistPlot™ programs) makes it part of an information management software system for personal computers. This ability to exchange data reinforces the power of the total software system; information created or stored by one program need not be rekeyed in order to be used by another. VisiFile records (and information stored by the other "Visi" products) may be transferred over phone lines by Personal Software's VisiTerm™ program. VisiFile is controlled by a "moving cursor menu" with prompting, similar to the kind of user interface in other Personal Software products. Information entry is simple and allows the user to custom design a "form-like" format on screen for input. Machine language sorting routines and multiple keyed-field indexes assure information retrieval within three seconds. Mailing labels up to five across and reports may be printed with VisiFile. When ready to print a report, the user may use a simple "row-and-column" format, or develop a custom format area six rows deep by the width of the paper. Elements of each record may be arranged in that area to suit the user. Records may be selected for printing (in addition to being sorted or indexed): for example, all customers from Kansas with orders greater than $10,000 may be selected at the time the report is printed. All reports can be easily set up, saved with the program. Arithmetic calculations, including column totals, also can be handled in reports. 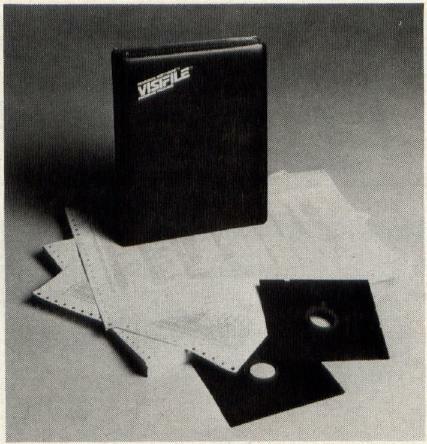 VisiFile runs on the Apple® II (with language card or Applesoft Basic card) and Apple II Plus personal computers with 48K minimum memory and one disk drive; two disk drives and a printer are recommended. Suggested retail price of the program is $250 (U.S. price only). It will be available in October.